TORONTO -- Success for the Toronto Maple Leafs this season won't necessarily be measured in victories. Rather, new coach Mike Babcock will be pleased if his players buy into his system, which basically requires dedication on and off the ice as well as simple hard work. "All we're going to do is build a process here, and I will make it very clear to the guys that I will be happy," Babcock said as he began his first training camp as coach of the Maple Leafs. "I like being happy, period. The two things that irritate me the most are lack of preparation and lack of compete. That's not happening." The Maple Leafs finished 15th in the Eastern Conference and 27th in the overall standings in 2014-15, leading to an offseason of major changes. In May, team president Brendan Shanahan hired Babcock, who coached the Detroit Red Wings for the past decade, led them to the Stanley Cup Playoffs in all 10 years and to the Cup in 2008, to take over behind the bench. Two months later, the Maple Leafs hired Lou Lamoriello as general manager. The Maple Leafs were 24th in non-shootout goals last season. Speedy right wing Phil Kessel led Toronto in scoring in each of the past six seasons, including 2014-15, when he slumped to 25 goals and had 61 points. He was traded to the Pittsburgh Penguins on July 1, and replacing his offense will not be easy. Babcock insists goals aren't his big concern and that he'll emphasize having his forwards play a disciplined, two-way game. Still, someone has to put the puck in the net. Left wing James van Riemsdyk, 26, slipped to 27 goals last season after scoring 30 in 2013-14. Center Nazem Kadri received a one-year contract after dropping from 20 goals and 50 points in 2013-14 to 18 and 39 last season. Babcock said Kadri, the seventh player taken in the 2009 NHL Draft, will start with a clean slate. The 24-year-old feels he has what it takes to be the Maple Leafs' No. 1 center. "I definitely do," Kadri said. "I made some changes and worked as hard as I could to be given that opportunity." The Maple Leafs hope newcomer Shawn Matthias can pick up where he left off last season, when he scored 18 goals in 78 games with the Vancouver Canucks despite getting virtually no time on the power play. Joffrey Lupul had 10 goals and 21 points in 55 games, but when healthy is capable of scoring 20-plus goals. Tyler Bozak returns after scoring 23 goals but struggling defensively (minus-34). A pair of 24-year-olds, Richard Panik and Peter Holland, each scored 11 goals last season and could take larger roles. The Maple Leafs expect big things from their past two first-round picks, centers William Nylander (2014) and Mitchell Marner (2015). But in case they decide some of their highly touted young players are not NHL-ready, they invited three veteran forwards, Brad Boyes, Curtis Glencross and Devin Setoguchi, to training camp on professional tryouts. 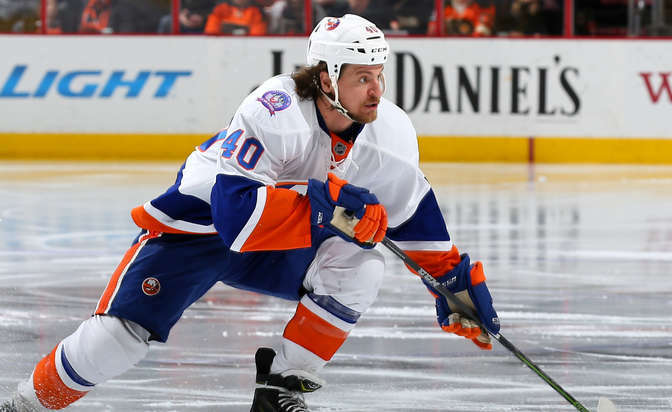 The Maple Leafs also acquired speedy right wing Michael Grabner from the New York Islanders on Sept. 17. The 27-year-old from Austria scored 34 goals and had 52 points in 76 games with the Islanders in 2010-11, his rookie season, but hasn't come close to those numbers since. Leo Komarov, one of the best hitters in the NHL, and Daniel Winnik are responsible defensive forwards who can chip in offensively. The defense is anchored by captain Dion Phaneuf. Babcock not only believes the 30-year-old is the right man for the job as captain, but that he's also a player who will help take the team to new levels. "I think he has great intentions," Babcock said. "I think you're an easy target when you are the captain. Lou's and my job is to look after him. I think he's going to have a real good year. I like Dion. He's the captain of the Leafs and he's going to be the leader of the Leafs." The rest of the top-four will likely include veteran Roman Polak and young defenders Morgan Rielly and Jake Gardiner. Polak, 29, is a robust defender who plays a physical game. Rielly, 21, and Gardiner, 25, have tremendous offensive upside. Rielly scored eight goals and finished with 29 points in his second NHL season; Gardiner had four goals and 24 points in 79 games. However, they were a combined minus-39. "They've got to get way better defensively," Babcock said. "Everyone knows Morgan Rielly has an elite upside, but Gardner, I think, should be a good player so let's build him up. Let's get him going. Let's get him to understand the faster you play defense, the more you have the puck and the less time you have to spend in the defensive zone." Veteran Stephane Robidas, who possesses great leadership qualities, had shoulder problems that limited him to 52 games last season. He'll likely take one of the other two spots. Stuart Percy, 22, looked impressive in nine games with the Maple Leafs last season, earning three assists. The 25th player taken in the 2011 NHL Draft is a smooth skater who is calm under pressure. Matt Hunwick, 30, who had two goals and 11 points with the New York Rangers last season, could crack the top six. He has 18 goals and 78 points in 347 NHL games. Others who could be in the mix include TJ Brennan, Petter Granberg, Viktor Loov and Mark Fraser. Babcock says the No. 1 goaltending job is up for grabs between Jonathan Bernier and James Reimer. "I like to have one guy to know who is the guy, and usually what I tell him is I'll let you know when you're not starting," Babcock said. "Someone's got to grab it." Bernier, 27, has played 55 and 58 games since being acquired from the Los Angeles Kings in June 2013. His goals-against average (2.87) and save percentage (.912) last season were worse than his numbers in 2013-14. Reimer, also 27, has struggled as Bernier's backup; his 3.16 GAA in 35 games last season was actually an improvement from 2013-14 (3.29 in 36 games). One reason for Toronto's struggles to score last season was a weak power play. The Maple Leafs slipped from sixth (19.8 percent) in 2013-14 to 26th (15.9) last season, even with Kessel. The power play often revolved around trying to set up the right-handed sharpshooter for a one-timer from his off wing. Coming up with a new plan figures to be a top priority for Babcock and assistant coach Jim Hiller, who came with him from Detroit. The Red Wings' power play was second in the NHL last season (23.8 percent). Babcock has more to build on with the penalty kill, which improved from 28th (78.3 percent) in 2013-14 to 22nd (80.5) last season. Babcock made a point during a meeting with the media at the opening of camp of saying he believes in surrounding himself with people who will make him better. "When I first arrived in the League (2002) I hired Paul McLean, a nine- or 10-time 30-goal scorer, and I hired Lorne Henning, who won four Stanley Cups [with the New York Islanders] as my assistants because I didn't have a clue what I was doing," Babcock said. "I felt I needed more experience. Now what I try to do is hire guys who are idea people that will make you better and change." Babcock brought Hiller and Andrew Brewer with him from Detroit and hired D.J. Smith, coach of the Memorial Cup champion Oshawa Generals. Toronto also hired Steve Briere as its goaltending coach. Brewer, Babcock said, has a special assignment. "Andrew Brewer is the smartest guy on my staff," Babcock said. "He was with me at the 2014 Olympics and I brought him to Detroit as a 'coaching concierge' and he just makes sure we don't look dumb. He makes sure our presentations are good. He's 29 years old, the age of the players, and he doesn't mind saying, 'Babs, they don't think like that. You're as old as the arc. They think like this.'" Jacques Lemaire, an 11-time Stanley Cup winner who worked with Babcock when Canada won the gold medal at the 2010 Vancouver Olympics, was hired as special assignment coach.